The Korean government doesn’t want Korean cuisine to be Los Angeles’ best kept secret, so the Culinary Institute of America (CIA) Greystone, based in St. Helena, Calif., in cooperation with the Korea Agro-Fisheries and Food Trade Corporation (also called aT for short), hosted a scholarship competition and recipe challenge on Oct. 26. The Korean government has worked hard, over the course of two presidential administrations, to preach the gospel of the health benefits and bold flavor profile of Korean cuisine. Korean trade officials are hoping their three-year-long relationship with the Culinary Institute of America will help spark the interest of America’s up and coming chefs in traditional Korean ingredients and that their evangelical fervor will spread onto the shelves of America’s grocery stores. CIA students from all three of their American campuses submitted recipe ideas and the five students with the most promising concepts were invited to travel to the CIA’s Greystone campus to compete for scholarships ranging from the first prize of $7,000 to the fifth place prize of $1,000. 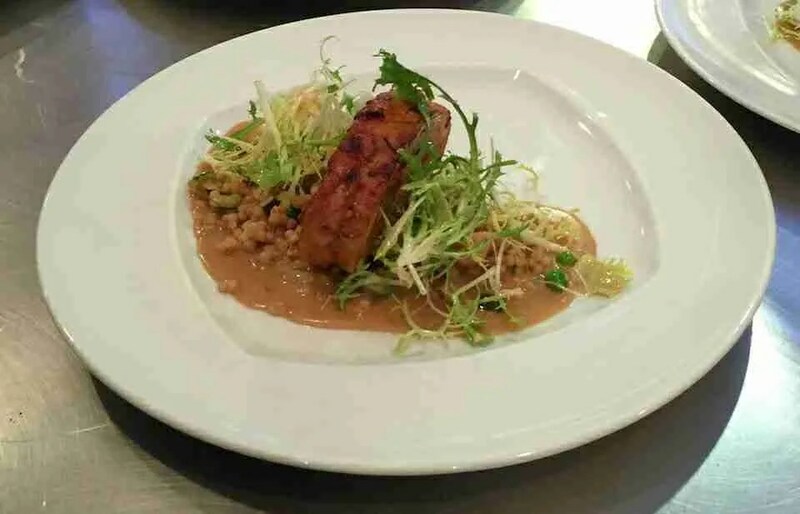 The culinary students were given a list of five Korean ingredients to chose as the inspiration of their recipes: gochujang, bulgogi sauce, kimchi, yujacha (citron tea) or boricha (roasted barley tea). The students were required to use at least two of the ingredients in their final recipe. The Korean Sensation Day at CIA Greystone was not just a scholarshp contest, it was also an opportunity for CIA students, media and guests to taste some innovative dishes using Korean ingredients. Eric Garcia, a student at the CIA Greystone in St. Helena. He made a recipe called K-town Carpaccio, which was made with gochujang and kimchi. 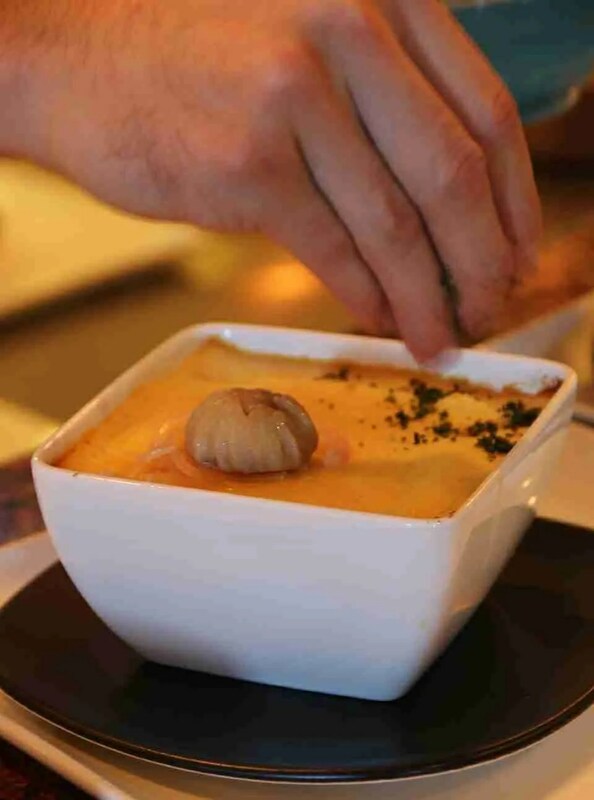 Stephen Neumann, a student at the CIA Greystone, made a dish he called Yangchigi Pie (which means Shephard’s pie in Korean) or Pâté Coreen was his his Koreanized take on a traditional Quebecois dish called Pâté Chinois, which strongly resembles an Anglo-American Shephard’s pie. This dish featured Korean sweet potato, kimchi and lamb marinated in bulgogi sauce. Elizabeth Aristeguieta, a student from the CIA in San Antonio, Texas. 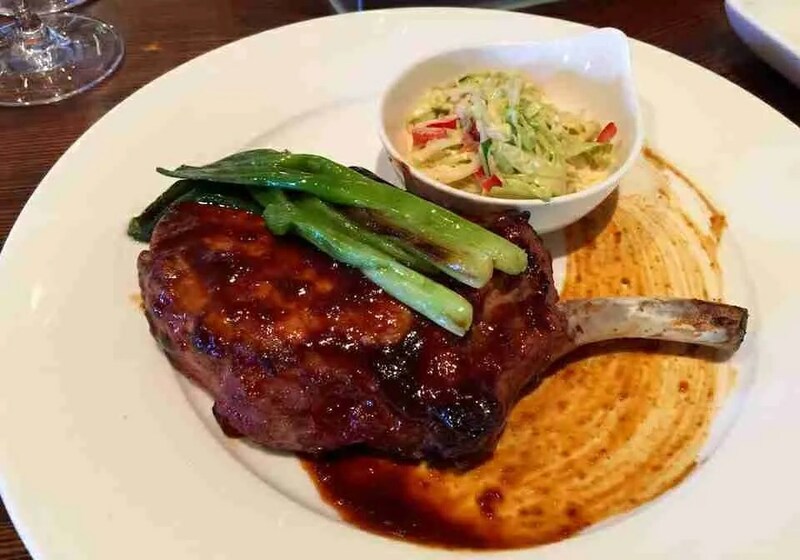 Her dish was called Mah-Sit-Sso-Yo Pork, which used roasted barley, yujacha and gochujang in the sauce and marinade, garnished with grilled green onions. 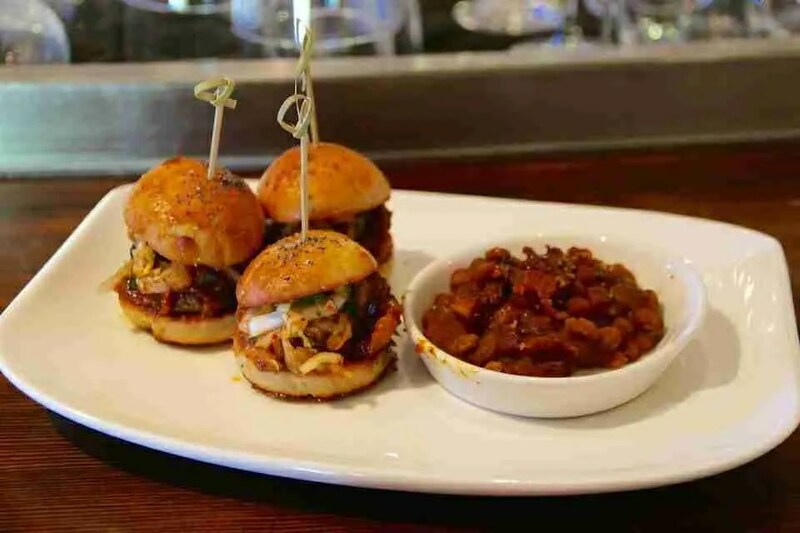 Sean Dodds, a student from the CIA in Hyde Park, N.Y., made Memphis/Seoul Pulled Pork sliders, flavored with bulgogi sauce, gochujang and topped with finely julienned kimchi. Jun Heum Park, a student from the CIA in Hyde Park. His dish, called Yuzu-like Ssam Pork, was a pork roll flavored with gochujang and yujacha. Mah-Sit-Sso-Yo Pork. Marja Vongerichten, host of the PBS TV series and author of the cookbook, Kimchi Chronicles praised the dish saying, “Wow, this is perfectly cooked. I can really taste the yuja.” (Tammy Quackenbush photo). Dodd’s Memphis BBQ pork slider featured pulled pork marinated in bulgogi sauce. It was cooked slow overnight sous vide. The recipe also had the distinction of using 4 of the 5 featured ingredients. Chef Hooni Kim called it, ‘The most delicious thing I’ve tasted today, but when you create something miniature, make sure everything is perfect. There’s no room for error.” (Tammy Quackenbush photo). None of the students left empty-handed. Each of them won an aT Center culinary scholarship. The grand prize $7,000 scholarship was awarded to Stephen Neumann (CIA Greystone) for his Yangchigi Pie (Shepherd’s Pie aka Pate Coreen). Mom’s home-cooking won Neumann a nice reward. Elizabeth Aristeguiesta’s (CIA San Antonio) Mah-Sit-Sso-Yo Pork won her second place and a $4000 scholarship. Maybe the dish’s name, which literally means “Delicious Pork,” was a subliminal message that help her come very close to the top. Eric Garcia’s (CIA Greystone) K-town Carpaccio won him the third place scholarship of $3,000. Fourth place went to Sean Dodd (CIA Hyde Park) and his Memphis Seoul Pulled Pork Slider and a $2000 scholarship. Jun Heum Park’s (CIA Hyde Park) Yuzu Ssam Pork came in fifth place, netting him a $1,000 scholarship. This scholarship was a student innovation challenge. The CIA and aT Center have no plans at this time to make this into an annual contest.